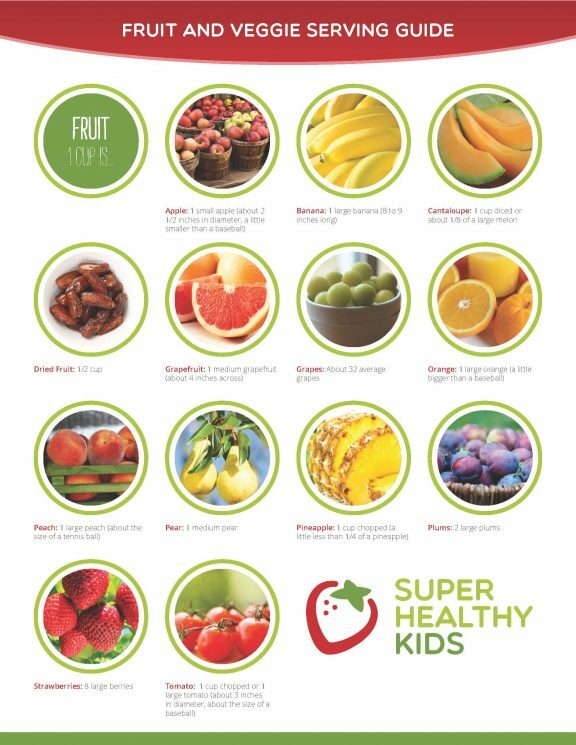 What are the daily recommendations for each of the food groups for kids? The amounts on the above chart are for individuals who get less than 30 minutes per day of moderate physical activity in addition to normal daily activities. Individuals who are more physically active may be able to eat more while staying within his/her calorie needs. How much food makes up a cup of fruit or a cup of vegetables? Generally, one cup of fruit, one cup of 100% fruit juice, or ½ cup of dried fruit is considered equivalent to one cup from the fruit group. 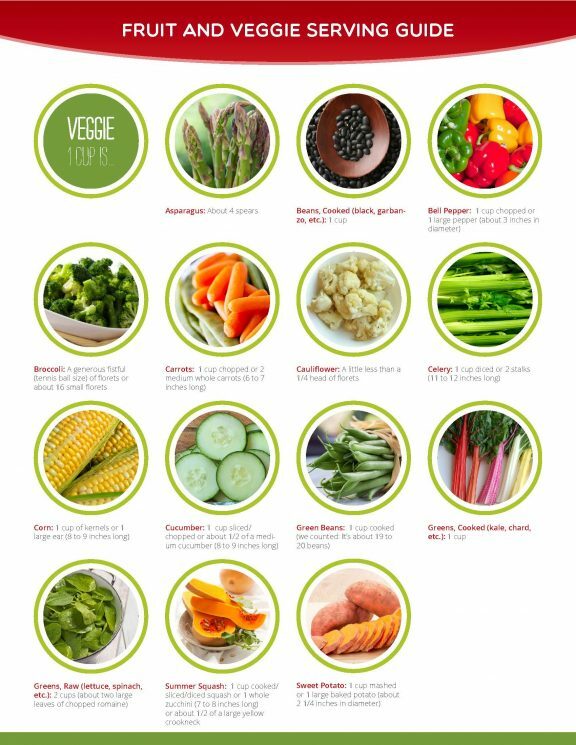 For vegetables, one cup of raw or cooked vegetables, one cup of 100% vegetable juice, or two cups of green leafy vegetables can be considered one cup from the vegetable group. How much grains make up an ounce equivalent? Generally, one slice of bread, one cup of ready-to-eat cereal, or one half of a cup of cooked rice, cooked cereal, or cooked pasta is considered a one ounce equivalent from the grains group. The Ounce Equivalent of Grains Table gives specific amounts of grains that count as one ounce servings. How much protein makes up an ounce equivalent? Typically, one ounce of meat, poultry, or fish, one egg, ½ ounce of nuts or seeds, ¼ cup cooked beans, or one tablespoon of peanut butter is considered a one ounce equivalent from the protein foods group. The Ounce Equivalent of Protein Foods Table gives more specific information as to what counts as an ounce of protein. How much dairy makes up one cup from the dairy group? In general, one cup of milk, yogurt, or soy milk, as well as 1.5 ounces of natural cheese and 2 ounces of processed cheese, are each considered to be one cup from the dairy group. A more detailed chart showing what counts as a cup of dairy is shown here. 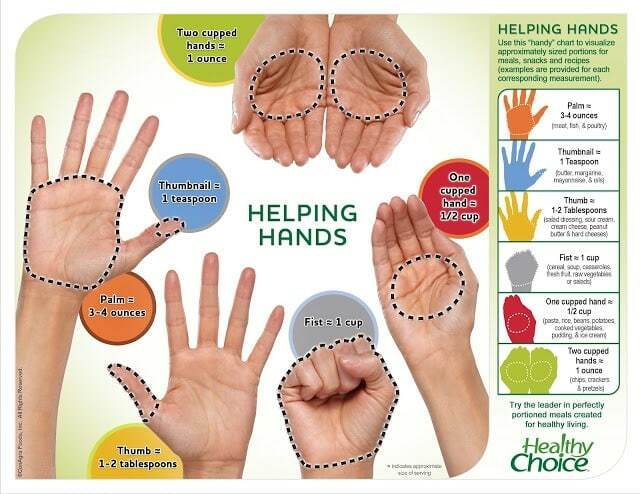 Now that you have a guideline of how much to each from each food group, here are some tips for portion control. Use portion control plates. 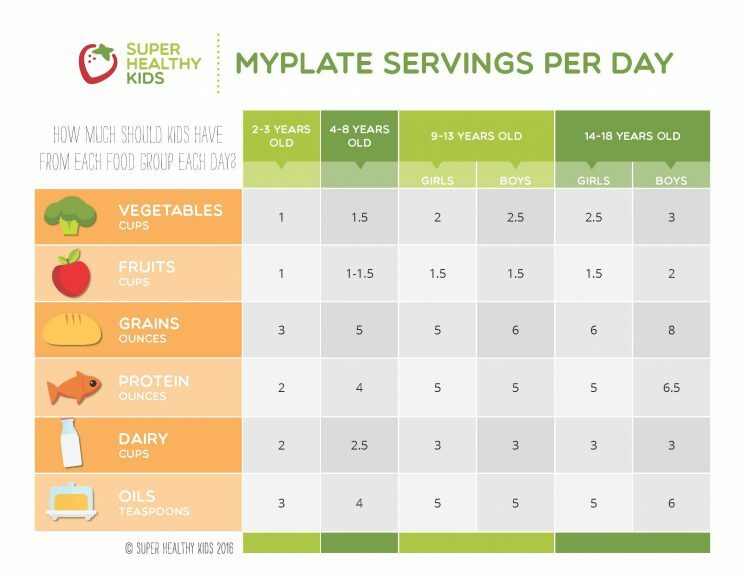 Using the Super Healthy Kids MyPlate plate for your children is a fantastic way to know the portion size without measuring since each section of the plate is already portion controlled. Measure, then eyeball. To become more aware of portion sizes, you can take the time for a short while to measure out serving sizes so that in the future you can eyeball your portions. For example, become familiar with what ½ cup of pasta looks like by first measuring, then you can more easily eyeball that amount in the future. Repackage foods that come in bulk into individual portions. This will reduce the temptation to overeat, and it will make the food more convenient to grab and go. Understand the difference: Serving size versus portion size. Serving size and servings per container are listed on the Nutrition Facts food label. The serving size isn’t telling you how much you have to eat or which foods/amounts that you need for optimal nutrition. It is merely giving you a quantity of food and how much calories, fat, and other nutrients are in that amount of food. A package may have two servings per container and each serving may be ½ cup. It’s up to you to determine your portion size (or how much you eat) from the package. And using the MyPlate guidelines for the daily recommendations for each food group can be your guide. The amount of food dished out at a restaurant or shown on a food label may not be the right amount for you or your child. Just because the seemingly small and not super healthy snack that was given to your child after the game may seem like one serving, it may be two or three servings. Check the label. You can always save the remainder of the container for another time. Teach children to listen to hunger cues. Stop eating when comfortably full. Eat only when hungry, and eat at the dinner table without the TV or other distractions. Portion sizes of foods eaten are as important as eating the right foods for getting the best nutrition for you and your family. MyPlate, with the recommendation to eat a variety of foods and guidelines on the amounts of foods to eat, is an excellent guide for getting your family on track to create healthy eating habits for a lifetime. 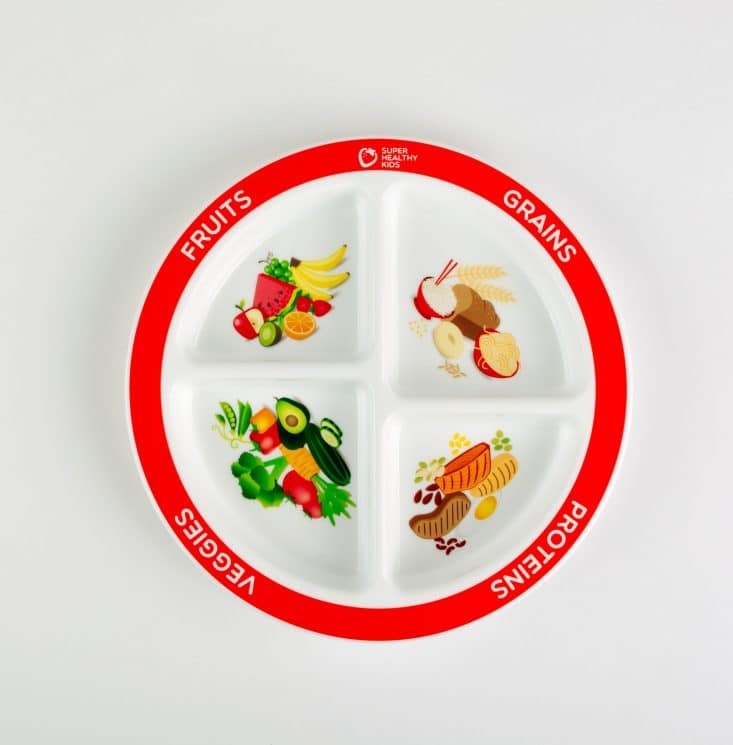 Take the guesswork out of portion size for your kids and feed them on our MyPlate or Healthy Habits plates. 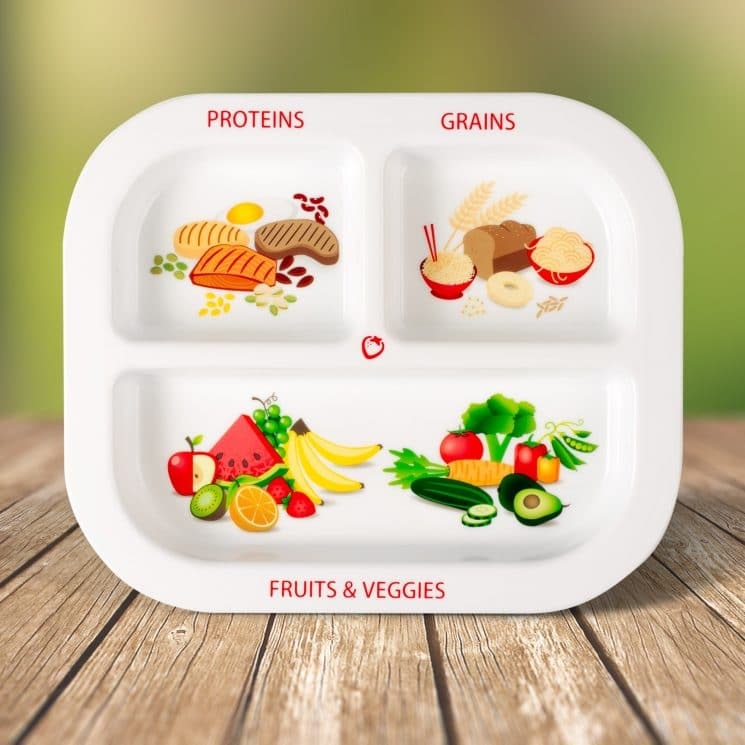 Portion sizes are already there for you with everything they need for a healthy balanced meal! What a great concept. It helps parents provide their kids healthier meals and also teaches and educates the children about balanced nutrition, at the same time.